One of the series of works known collectively as “La Dame a la Licorne”, “Sight (La Vue) II” shows a lady holding a mirror in which the unicorn’s reflection appears. Like others in the series, this tapestry was commissioned by Jean Le Viste to mark his appointment to the court of King Louis XI. The Le Viste family crest can be seen in the banner – three crescents on a diagonal blue stripe against a red background. “Sight” was woven sometime in the 16th century. The background, which is done in the Mille Fleur style, shows that it was probably woven in the mills in Flanders during that period of time. 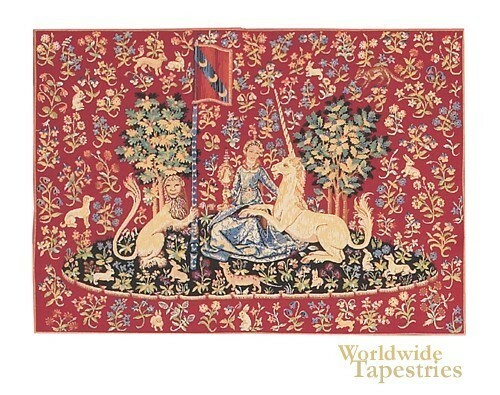 While the series of tapestries fell into different hands after the death of Jean’s daughter, Claude, they have been reunited at the Musee National du Moyen Age in Paris, where they have been restored and placed in a specially built room. “Sight (La Vue) II” can grace your own home with this wonderful reproduction. This tapestry is lined on the back and has a tunnel for easy hanging. Dimensions: W 26" x H 18"